Michael was overwhelmed when he contacted me for help to organize his office. He wasn’t satisfied with his productivity and couldn’t figure out what to do. I heard the frustration in his voice as we spoke. 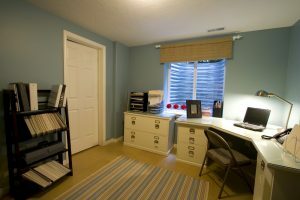 Having helped many people organize their offices at home or work, I’ve noticed several mistakes they all have in common. Solution: Make a list of all supplies you use, buy them and keep them on or in your desk. Solution: Keep supplies where you use them (if you use a stapler in your office and somewhere else, keep one in both places). Solution: Keep a minimal amount of supplies in or on your desk and bulk supplies in a storage area. Solution: Sort the papers, put them in labeled file folders, then in a file sorter (on the extreme right in the photo) or stacking trays (top of credenza on the left in the photo) within arm’s reach of your desk. Solution: Keep notes together in one place (electronic or paper). Sometimes it’s the little things that trip us up. These simple solutions increase focus and productivity and eliminate seemingly minor annoyances that reduce productivity.